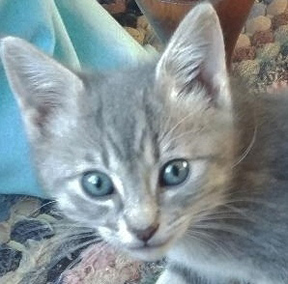 Davaa is an all grey kitten with faint tabby stripes whose role in any household is to dash about and pounce upon every small object he can find. Plus, climbing any object too high for his ability to jump, all while waiting for someone to grab a wand toy and play, play, play. After which, he enjoys telling one all about his adventures as he snuggles into one’s lap for a nap. He most wants to be one’s buddy.